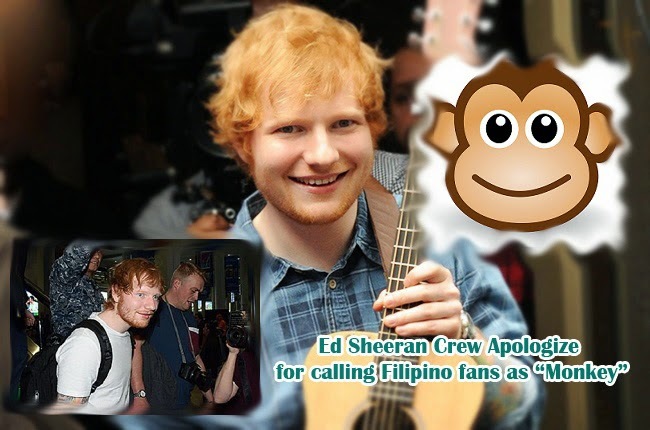 Ed Sheeran’s entourage member had already apologized after calling Filipino fans as ‘monkeys’ in the NAIA. The British singer arrived on March 11 in Manila for the one night sold out concert in Mall of Asia Arena on March 12, 2015. According to Manila International Airport Authority, Sheeran and his crew was provided airport security and was given the privilege to pass through immigration and custom in a breeze. The 24 year old British singer had come to the Philippines as part of the Asian leg tour for his album ‘Multiply’ which features ‘Thinking Out Loud’. However, inside the Customs Office, fans and journalist seemed to have gone overly excited and took photos out of control. One of the crew then shouted and called the fans monkeys which then prompted the immigration officer to confront him saying that the racist term could cause him persona non grata which will prevent him from returning to the country. The other members of entourage had explained that the word was not meant to be racist and it was only an expression. The crew member has apologized to the immigration officer and to the fans. Ed Sheeran had also toured in other Asian cities such as in Seoul, Dubai, Doha, Shanghai, Hongkong and Mumbai. After the Manila concert, he will then go to Kuala Lumpur and Singapore.